Mercury and Jupiter shine in this amazing view of the night sky captured by Pete Lawrence on March 13, 2011. Venus, Jupiter, Mercury and Saturn are all visible in the May 2015 night sky. The "elusive planet" Mercury kicks off the month in the midst of its best evening apparition of 2015. But Mercury isn't the only visible planet this month. Jupiter, "King of the Planets," sits high in the southwest as darkness falls and remains in good position for telescopic viewing until after midnight. Venus reaches the pinnacle of its evening visibility, not setting until almost the middle of the night. Here, we present a schedule that provides some of the best planet-viewing times and provides tips and tricks to spot them. May 7– Mercury has taken a superb leap into the evening sky. On May 7, it arrives at its greatest eastern elongation of 21 degrees (remember your clenched fist held at arm's length measures roughly 10 degrees). Just 2 degrees to its right you may be able to spot the Pleiades. Have you ever seen this wintertime cluster in the evening so late in spring? Its conjunction with the sun will occur May 20. As it swings to the near side of the sun, Mercury fades about 0.16 magnitude per day. So the earlier this month you look, the easier it will be. You'll have quite a bit of difficulty after May 14. Inferior conjunction will be on May 30. Also in the western sky is dazzling Venus, which reaches the peak of its fine evening apparition in May, burning prominently in the west during twilight and long after dark. All month, Venus stands due west almost 40 degrees high at sunset (for observers around 40 degrees north latitude). How soon after sunset – or even before! – can you first pick it out of the deepening blue? Brightening from a blazing magnitude -4.2 to -4.4 this month, Venus seems to swell enormously as twilight fades, and all through May it remains shining in a dark sky for about 1.5 hours after twilight's end. Telescopes reveal Venus swelling somewhat while waning in its gibbous phase. By the end of May it's hardly more than half lit. May 9 –Venus passes less than 2 degrees from the star cluster M35 in the feet of Gemini. 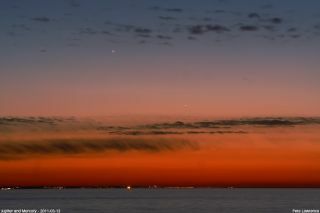 May 21– Despite being widely separated by more than 8 degrees, Venus and the crescent moon still make for an eye-catching scene in the west-northwest sky. Venus is situated far to the upper right of the moon. May 22 –Saturn becomes the second planet this year to reach opposition, that is, to be opposite to the sun in our sky. It rises in twilight for most of May and is visible for the rest of the night. Saturn is 10 degrees northwest of the red star Antares, and is shining at magnitude 0.0, unusually bright for this faintest of the five classical naked-eye planets. The reason is that its rings are tilted 24 degrees toward us, presenting a larger-than-usual profile. The rings will be tilted to their maximum extent of 27 degrees in 2017. May 23 – Standing high above the wide crescent moon this evening is Jupiter, the second brightest "evening star." It shines at Venus' upper left. The two are 50 degrees apart at the beginning of May, but close to 21 degrees by month's end. It's easy to find, owing to its brightness. As soon as the sky starts getting dark, this planet, near magnitude -2.0, comes into sight high in the west. Jupiter remains beautifully placed for telescopic viewing at nightfall. May 30– Mercury is at inferior conjunction with the sun and enters the morning sky. Editor's note:If you snap an amazing photo of the planets in May's night sky, and would like to share them with Space.com for a story or gallery, let us know! Send photos and comment in to: spacephotos@space.com.